Information About Russian Region Chukotsky Autonomous Okrug. Chukotsky Autonomous Okrug borders upon Koryak AO, Magadanskaya Oblast and the Republic of Sakha (Yakutia). The climate is extremely severe. Winters last 8-9 months. The average temperature of January on the shore of the Bering Sea varies from -15 to -21 degrees, in the inner parts - from -27 to -39 degrees centigrade. The lowest temperatures are from -38 and -55 degrees centigrade. Summers are short, cool and rainy. The average temperature of July in the northern districts is 5 - 8 degrees above zero, on the shore of the Bering Sea it is 9 -10 degrees. Precipitations are 200 mm a year. The permafrost is everywhere. Vegetation is mainly that of tundra. Bushes, lichen (reindeer moss, Cetraria), moss, etc. The region includes 8 districts, 2 cities, 18 urban settlements and 45 villages. The regional centre is Anadyr (the population on the 1st of January, 1998 is 13,2 thousand inhabitants). The city was founded in the year of 1965. The distance between Magadan and Anadyr is 1525 km. The basic industry is the mining industry (gold, tin, tungsten, mercury, black and brown coal). Manufacture of building materials is also developed here. 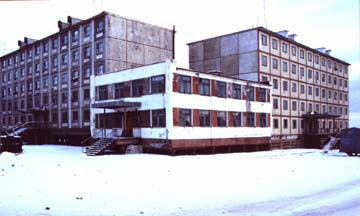 The main industrial centers are the cities of Anadyr, Pevek, Bilibino, the urban settlements of Iultin and Beringovsky. Fishing, hunting, reindeer breeding, dairy cattle breeding, poultry farming, swine-breeding and fur farming are also developed here. The local ports are Pevek, the settlement of Providence, Anadyr, Egvekinot, Beringovsky. The rivers Anadyr, the Velikaya, the Bolshoy and Maly Anyuy are navigable. 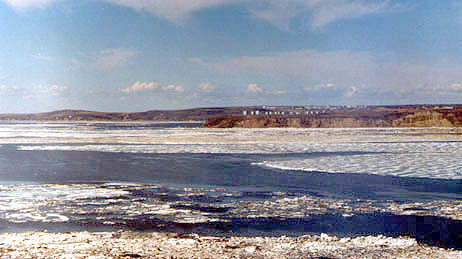 Chukotsky AO is washed by the East Siberian Sea, the Chuckchee Sea and the Bering Sea. The largest rivers are the Anadyr (with its tributaries Main, Belaya, Tanyurer), the Velikaya, the Amguema, the Omolon, the Bolshoy and Maly Anuy. There are a lot of lakes, the largest among them are the Krasnoye and the Elgygytgyn. The minerals are the deposits of tin and mercury, black and brown coal, gas, etc. The word 'Chukotka" originates from the Russian name of the ancient people Chukchis (own name Lygoravetlan). The word "Chukchis" means "rich in deers" ('chauchu'). Thus, "Chukotka" means the residence of deer people (the Chukchis) under power of Russia. The Northeasternmost museum of Russia is situated in Chukotski AO, in the settlement of Providence. The Museum of Local Lore tells about the discovery and development of the Chukotski Peninsula, about the culture of the Chukchis and Eskimos.